AMD's vaunted Ryzen CPU is a multithreaded monster with one glaring weakness. Admit it. You love underdog tales. The Cleveland Cavaliers coming back from a 3-1 deficit against the Golden State Warriors. The New York Giants defeating the 18-0 New England Patriots, and the Average Joes beating the heavily favored Purple Cobras in the dodgeball finals. Well, you can now add AMD’s highly anticipated Ryzen CPU to that list of epic comebacks in history. Yes, disbeliever, AMD’s Ryzen almost—almost—lives up to the hype. 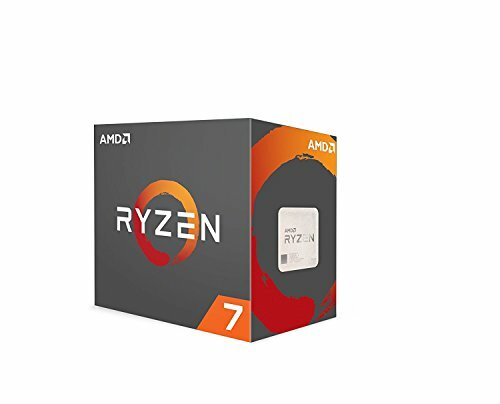 What’s more, it delivers the goods at an unbeatable price: $499 for the highest-end Ryzen 7 1800X. That’s half the cost of its closest Intel competitor. 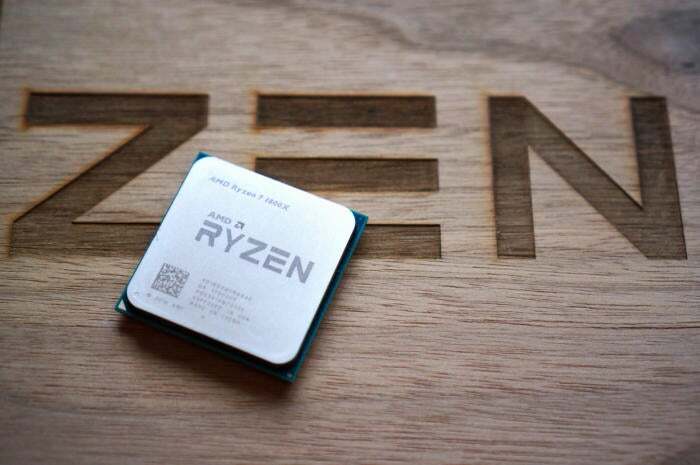 But before AMD fans rush to rub it into Intel fans’ faces, there’s a very important thing you need to know about this CPU and its puzzling Jekyll-and-Hyde performance. For some, we dare say, it might even be a dealbreaker. Read on. The boxed Ryzen 7 1800X and Ryzen 7 1700X won’t come with stocker coolers. We can’t get into a review of Ryzen without first recalling the tragic circumstances that came before it: AMD’s Bulldozer and Vishera CPUs sold under the FX brand. Intended as a competitive comeback to Intel’s own epic comeback chips—the Core 2 and Core i7—AMD’s FX series instead went down in flames performance-wise. The failure of Bulldozer and Vishera left AMD languishing for years, all but abandoning the high end and nursing itself on an ARM CPU for servers. In fact, the last time AMD had a truly competitive CPU, people still listened to INXS, the Weakest Link was a thing, and George W. Bush was president. The technical term for that is: a hell of a long time ago. Ryzen is nothing like its star-crossed predecessors, though. The FX CPUs used a technique called clustered multithreading (CMT) that shared key components of the chip; they were built on an uncompetitive 32nm, and later 28nm, process; and the 8-core versions more often than not lost to Intel’s 4-core chips. As anyone who has wallowed in failure only to return to greatness knows, tragedy and loss only make an underdog story sweeter. With Ryzen, AMD rebooted its CPU design, tossing aside CMT. It even adopted a technique from Intel’s playbook called simultaneous multithreading (SMT), which virtualizes CPU resources. AMD’s new Ryzen CPU does away with the shared cores of the FX line in favor of stand-alone cores with simultaneous multithreading. Whereas AMD’s design once had every two cores share resources, each Ryzen core is now a distinct entity built into a four-core complex. In the shot below, two core complexes make up an 8-core Ryzen chip. Each Zen core complex is made up of four individual CPUs. 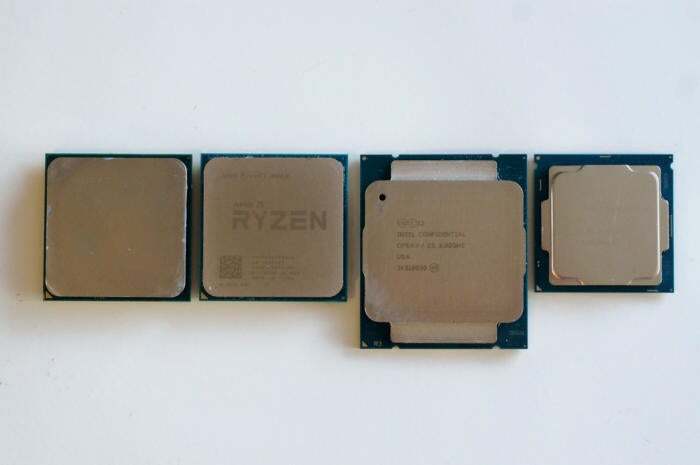 Two of these complexes make up the 8-core Ryzen chip in the preceding image. Also gone are the 32nm process of Bulldozer and the 28nm process of Vishera. Ryzen CPUs are built on a state-of-the-art 14nm process by AMD’s spun-off fab, Global Foundries. In short, the core design seems to have set the stage for an AMD return to glory. AMD’s Ryzen 7 lineup compared to Intel’s CPUs. It should be pointed out that Ryzen’s chipset isn’t exactly heavy-duty. 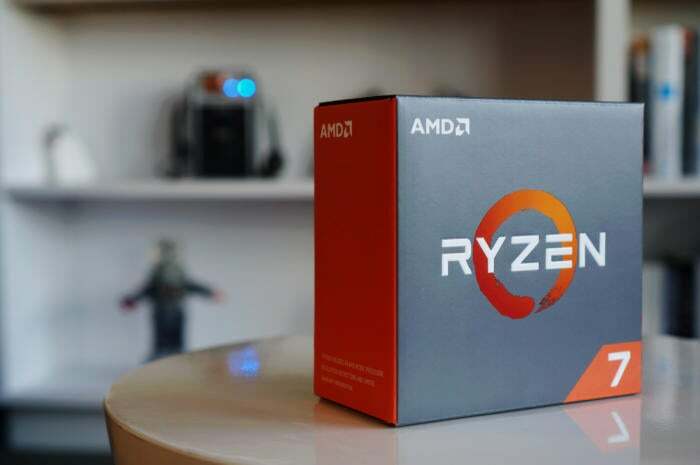 Because Ryzen is more of a system-on-chip (SoC) than a CPU, it contains many interface features on-chip, which are augmented by a particular AM4 socket chipset (to learn more about the various chipsets, see our guide to choosing an AM4 motherboard.) The upshot is that while Ryzen provides up to eight physical cores, the surrounding infrastructure is more consumer-oriented. Ryzen has 24 PCIe lanes total, 16 of which are dedicated to the GPU. If you go with the highest-end motherboard chipset, the X370, in order to run two video cards, that single x16 is split into two x8 connections. The remaining PCIe lanes can be used by the motherboard maker for NVMe or other I/O options. That’s not much different from what Intel does with the current Core i7-7700K ($349 on Amazon), which also has 16 lanes of PCIe for the GPU. While Intel’s highest-end consumer Z270 chipset appears to have a lot more I/O with up to 24 lanes of PCIe, a bottleneck between the consumer-grade chipset and CPU keep it from being utilized. For most people, there is still plenty of speed on tap with Ryzen and Core i7-7700K. But for those who need insane numbers of PCIe lanes, for, say, multiple NVMe drives that will be used simultaneously, Intel’s Broadwell-E and its X99 chipset have the advantage. In order of appearance: AMD’s FX, an AMD Ryzen, an Intel Core i7-5960X, and an Intel dual-core Kaby Lake CPU. Broadwell-E and Haswell-E feature up to 40 lanes of PCIe directly wired to the CPU, plus an additional eight lanes of PCIe in the X99 chipset. But, again, for the vast majority of consumers, even prosumers, that’s overkill. AMD has already said Ryzen exceeds its goal of a 40-percent increase over previous designs—in fact, it has hit a 52-percent increase in clock-for-clock performance over the Piledriver cores. But no one cares about that. The only thing you want to know is how it does against Intel. Read on for how we tested.